Exciting news…The hops we ordered last week have just arrived! As most of you probably know, there has been a bit of a hop shortage this year, and brewers throughout the craft brewing industry have been scrambling to get their hands on enough hops to meet their production schedules. Obviously we haven’t been able to start brewing yet, but with the shortage of most hop varieties, and with some varieties being nearly impossible to get these days, I figured I would order some while they were still available and store them in the freezer until we can start brewing. We ordered 165 pounds in total, which will be just about half of our hop supply for the first year of production. We were even lucky enough to snag a 44 pound box of Cascades! Woohoo! 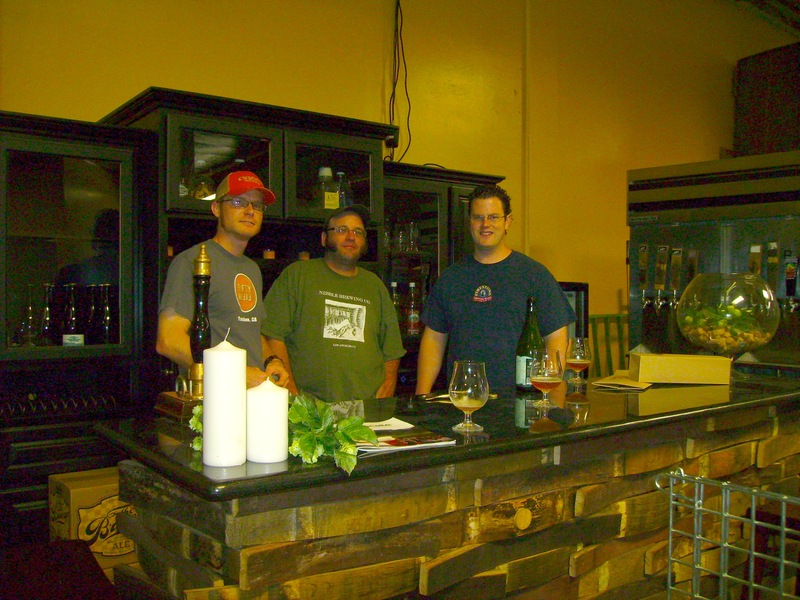 On Friday, I went along with Brian Lethcoe (from Nibble Bit Tabby Brewing Co.) for a visit to the two new microbreweries in Orange County, The Bruery and Bootlegger’s Brewery. Both of these breweries have been working hard over the past year and going through the same bureaucratic and logistical exercises that we are going through now. But just a few months ago, both Patrick (The Bruery) and Aaron (Bootlegger’s Brewery) saw their dreams fulfilled as they were finally able to open their doors and sell their first batches of beer! Thanks to Patrick and Aaron for letting us pick their brains on how to get it done, and for showing us that there IS a light at the end of the tunnel (or more accurately that there is BEER at the end of the tunnel)…Cheers guys! One other exciting bit of news is that Patrick just got the approval for on-site sales at The Bruery! Now you can buy his beers and sample his creations right at the source. Aaron’s business partner, Mike, is also his father. 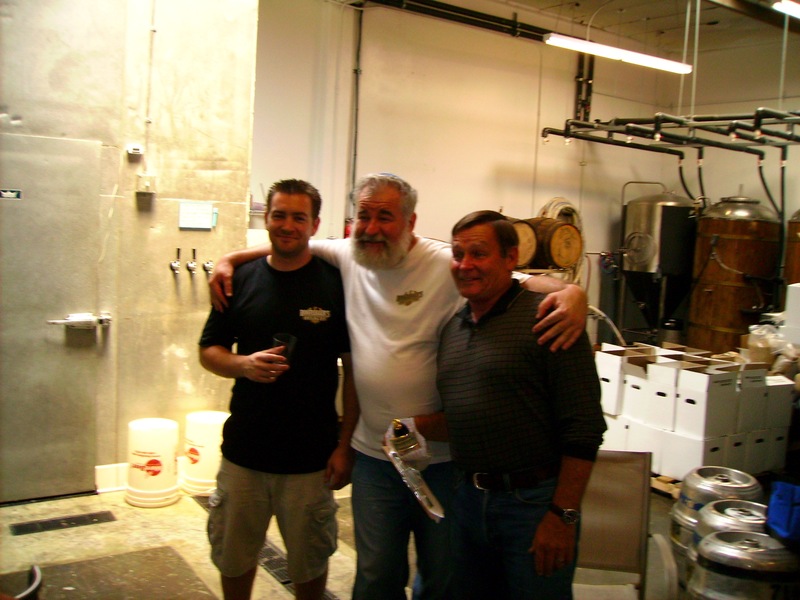 It was nice to see that, since my dad and I are also business partners, trying to get our own microbrewery started. Congratulations guys for getting it done! 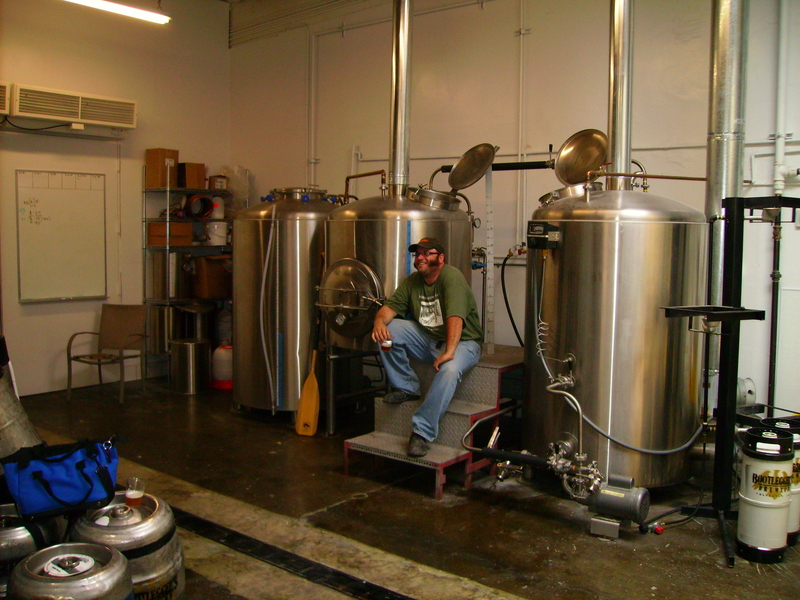 Here’s Brian sitting with the brewhouse at Bootlegger’s. This system is almost identical to the one that Brian bought for Nibble Brewing Co, so it was cool for him to get to see it hooked up and operational. I was finally able to submit the application for the Conditional Use Permit with the City Planning Department today! I know it doesn’t sound very exciting, but the stack of papers and maps for this application is seriously monstrous! It’s also quite an important step because without the Conditional Use Permit, we won’t be able to open for business in this location. The good news is that they accepted the application without sending me away to make corrections, which can often happen. Now we just wait for the Zoning Administrator to schedule a public hearing, and then to make a determination on our approval. Yes, there is LOTS of cleaning to do. But cleaning is always more fun when you’ve got friends and family to boss around…I mean, to share the pain with you. Here’s a few pictures of our latest day of cleaning. 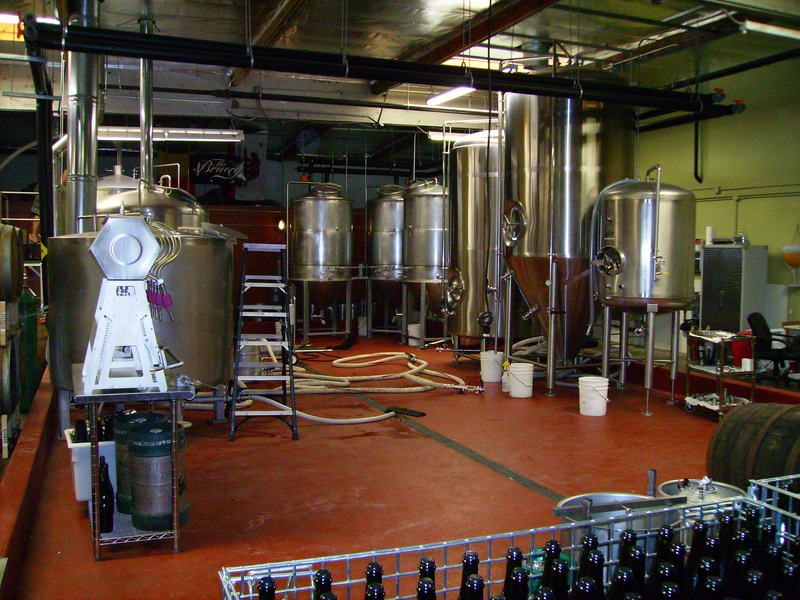 The Brew Kettle and Hot Liquor Tank are nice and shiny now, so we’ve moved onto some of the fermenters. 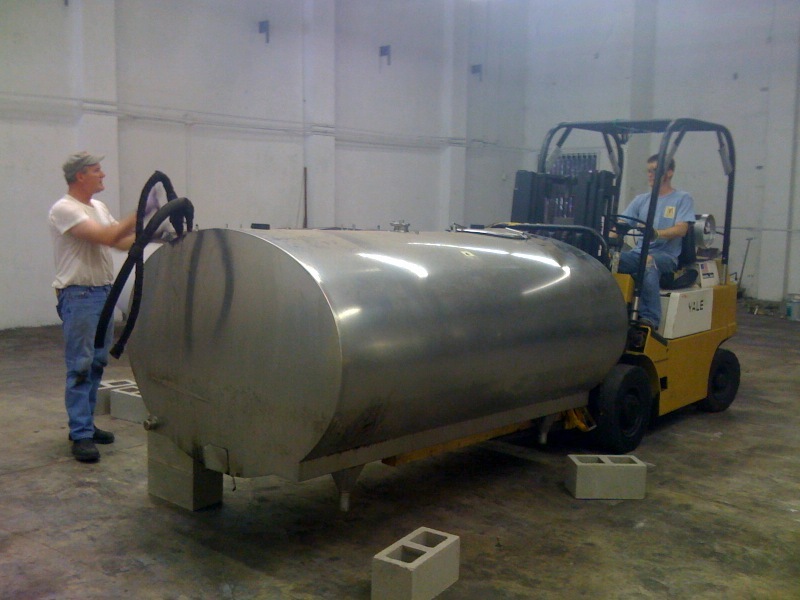 Here’s my dad guiding me on the forklift as we raise one of the secondary fermenters up onto the cleaning blocks. Check out the grime on the lower half of the tank. It can’t be considered a sweatshop if it’s family, right? 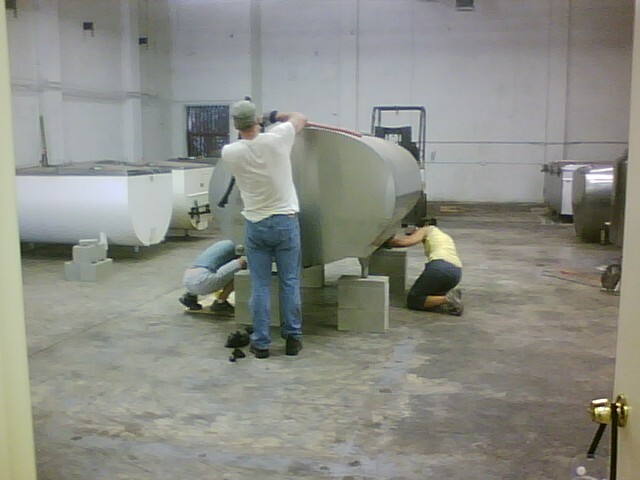 Well…good thing they’ll work for beer! 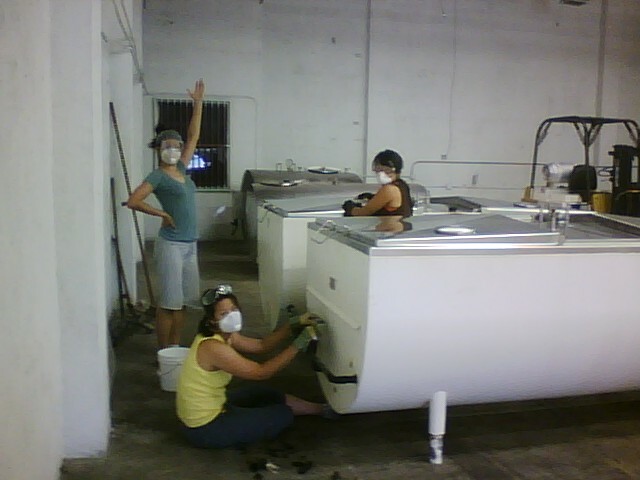 How do you know when you’ve spent too much time on a hot summer day, toiling away on some grimy tanks? 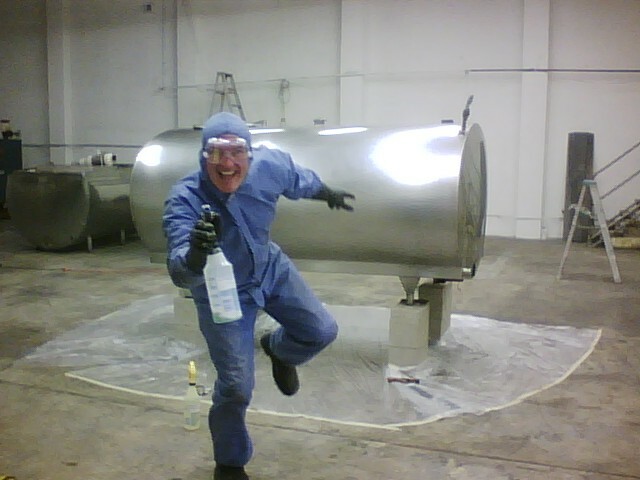 Right about the time the guy in the space-suit shows up with a bottle of shiny-spray! That’s when you get to go home. Hooray! Had a great time this weekend meeting Brian Lethcoe of Nibble Bit Tabby Brewing Company (also known as Nibble Brewing Company), based in Downtown Los Angeles. Like us, Brian is still in the startup phase of operations, but he’s a bit further along in the process than we are at the moment. Brian is focusing on the small batch production of traditional ales, and was kind enough to share a sample of his excellent and malty Irish Red Ale with me. I can’t wait to see his tap handles popping up in the local beer bars of Los Angeles soon…Keep an eye out for them! There is no doubt that starting a microbrewery is very hard work, but I have to say that it feels good, and is somehow reassuring, to meet a similar-minded brewer in the neighborhood, who is aiming for the same goal of a better beer scene in our home town. It was also really great to have someone to commiserate with about the intensely bureaucratic process of starting ANY business in the City or County of Los Angeles. I’m definitely looking forward to supporting him and following his story as he gets closer to an opening day. I’m sure there will be some collaborative brews and adventures once we both get ourselves up and running. Cheers to a better beer culture in LA! It’s on its way! 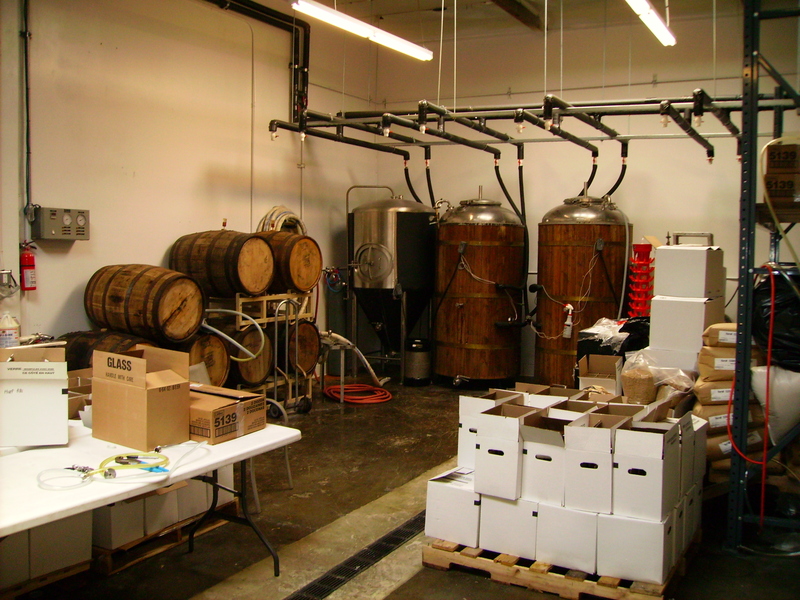 The building we have is 4,500 total square feet, although the brewhouse will only end up being about 1,500 square feet. Our batch capacity is 17 Bbls maximum, but our average batch size will probably be around 15 Bbls (due to fermenter head-space). I think probably the smallest building you would want for a brewery this size would be 2,000 square feet, but that wouldn’t allow very much room for growth over the years. Our building is probably bigger than we need at the moment, but it will certainly give us ample room for growth in the future. The tap-room area only takes up about 1,200 square feet, so we could easily triple our current number of fermenters, and grow the brewhouse significantly, without getting too cramped. This is all kind of related to a meeting we had today with the Department of Building & Safety, in which we were looking at square footage for all areas of our building. We took our preliminary set of floor plans to show them, which includes our proposed layout for the tap-room and brewhouse. The good news is that there are no major problems with our plans, and that we should be able to move forward as soon as we get our Conditional Use Permit (for serving alcoholic beverages) from the City approved. For us, the main purpose of the meeting was to establish the maximum occupancy load for the tap-room, determine how many exits we need, based on that occupant load (for fire safety purposes), and to determine the number of parking spaces required for the building. As I said earlier, most of this information is based on square footage in various areas of the building, and then multiplied by a ratio determined by the Building Code.